The battle for the quarterfinal stage in the Aik Awam Unity Cup began as the Round of 16 got underway on Saturday. 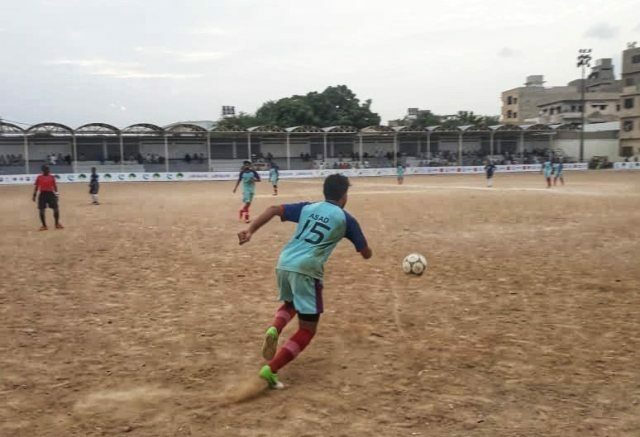 Al Wajid FC, Young Meeran FC, National Fighters FC and Light of Baloch won their Round of 16 matches at the Gizri Playground and have progressed to the next stage of the competition. Al Wajid picked up a 2-0 victory over Young Tughlaq. Irtiza opened the scoring for the side in the 19th minute and Zafar netted the second goal in the 50th minute. 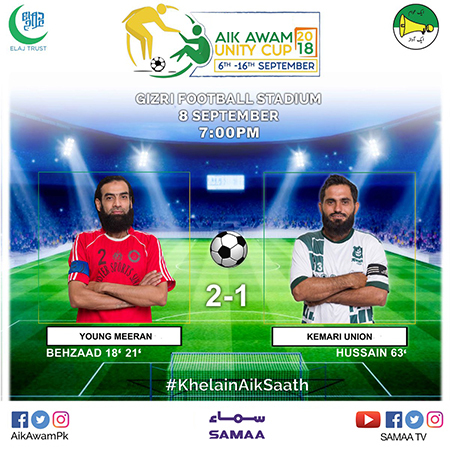 The Round of 16 fixture between Young Meeran FC and Kemari Union went down to the wire but it was the Meeran side which emerged victorious. Behzaad provided the start Young Meeran was looking for as he scored in the 18th and 21st minutes. Hussain managed to pull a goal back for Kemari in the 63rd minute but it was not enough to secure a victory. 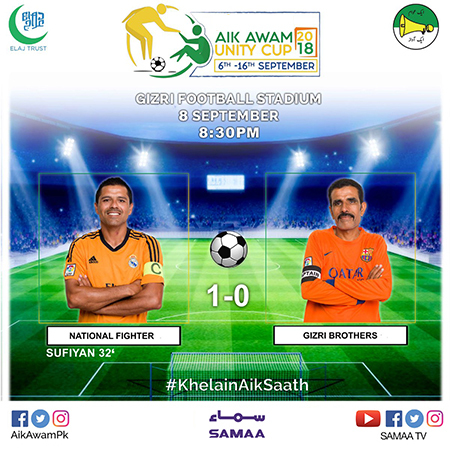 The National Fighters clinched a 1-0 win over the Gizri Brothers. Sufiyan scored the only goal of the match in the 32nd minute. 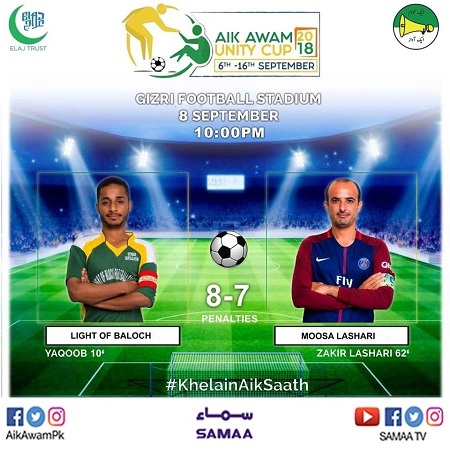 Light of Baloch edged past Moosa Lashari by 8-7 on penalties. 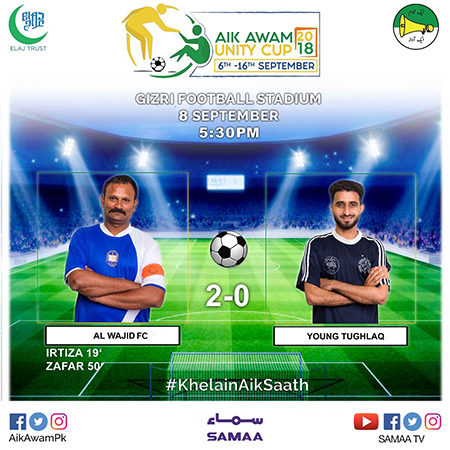 Yaqoob put Light of Baloch ahead in the 10th minute but Zakir Lashari equalised the match for Moosa Lashari in the second half. The Baloch side edged past the opposition in a nerve-wrecking penalties to secure the win. Teams registered under the Sindh Football Association are taking part in the event. The winning team will get a cash prize of Rs100,000 while the runners-up will be awarded Rs50,000. The teams which finish at third and fourth place will be awarded Rs25,000 each.